Unlike Lower Lonsdale, Hastings in Burnaby and even tiny Ladner, there aren't a whole lot of Japanese restaurants in North Delta. To further compound the problem, the ones that are located in North Delta are nothing to write home about. Without much competition, Minori has become the default "best" of a sorry bunch year after year. 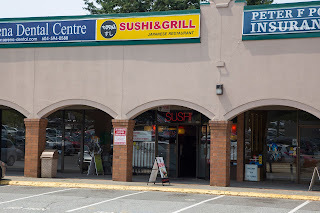 However, a new competitor has opened up shop in the ol' Gawa Sushi location, which incidentally is across the street from the aforementioned Minori. 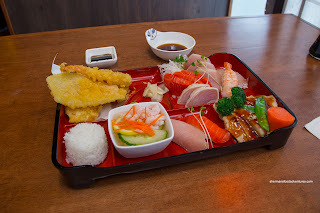 For my first visit, I decided to get a taste of everything with the Sushi & Sashimi Box. This was a substantial amount of food consisting of tempura, sashimi (salmon, tuna, tai, ebi and tuna tataki), rice, sunomono salad, nigiri and chicken teriyaki. I thought the sashimi was quite good including the appealing sockeye salmon. 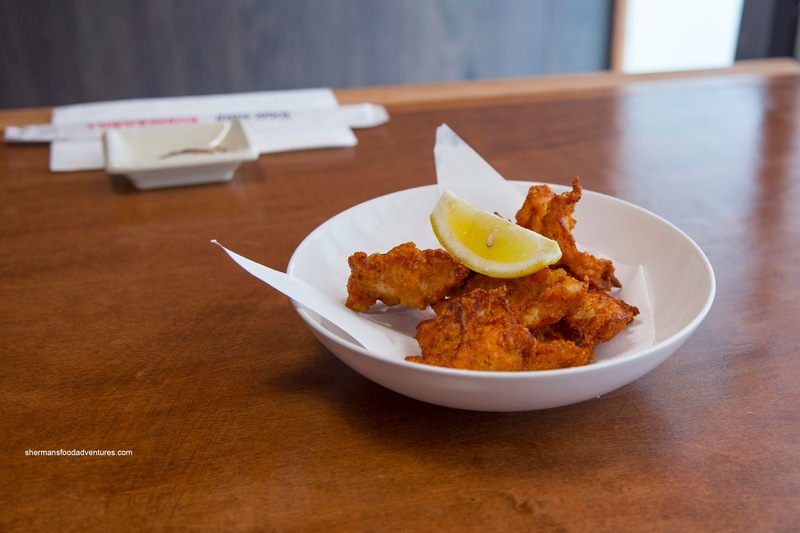 The tempura was on the greasier side, yet crispy. Interestingly, the chicken teriyaki was made of white meat, but they managed to keep it moist. On my next visit with Bookworm, he had the same box which looked exactly the same (consistency I guess). 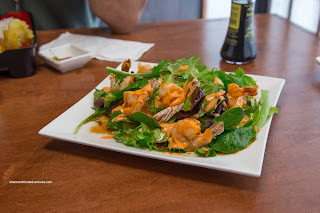 I started with the Ebi Mayo Salad which was not very good. The greens were overdressed with an extremely oily dressing. Chewy and overcooked, the ebi were not coated with enough batter. The chili mayo was quite nice though. For my next dish, I went for the Awesome Roll, which appeared to be decently constructed. 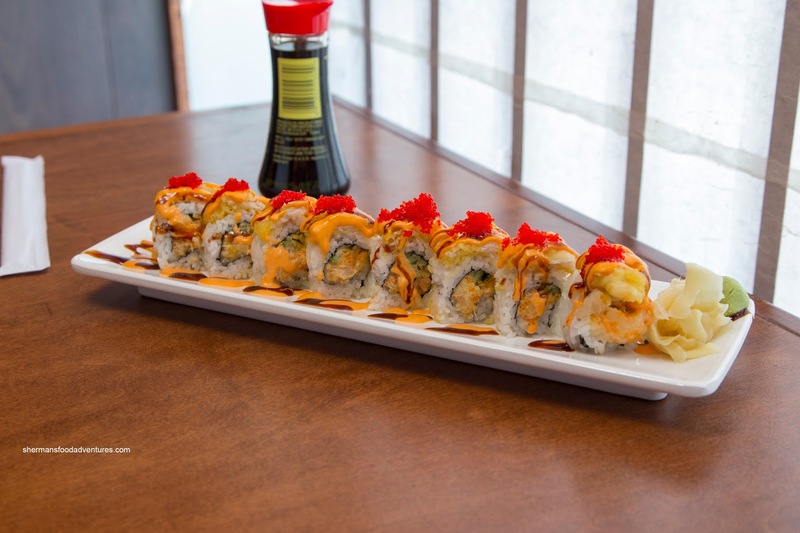 It was comprised of spicy chopped scallop, tobiko and cucumber topped with fried snapper and more tobiko. Each piece stayed together, yet at the same time, the rice was a touch on the drier side. Although there was a good amount of sauce, it wasn't overwhelming. Since I was in the area, I decided to give Todai one more visit. I chose the Chicken Karaage as my starter and it arrived piping hot. So hot, that I burnt my lip! It was made with breast meat with barely any batter. Hence, the exterior was more chewy than crispy. Inside, the meat was decently moist for white meat. It was mildly seasoned where the lemon wedge was necessary. I would've liked some sweet mayo to add both moisture and extra flavour. My last item was the Katsu Don featuring a large tonkatsu on top of an omelet and rice. I felt this dish was well-executed and portioned. The tonkatsu was meaty while still tender with an appealingly crunchy breading. 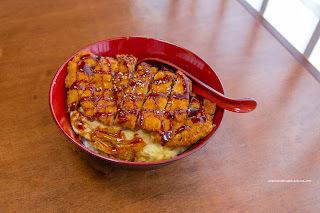 It was topped with enough tangy tonkatsu sauce to flavour the rice as well. About that rice, it was on the drier side, but that was okay as I prefer that over mushy. Although not the most amazing Japanese food I've ever had, Todai is far and away better than the joint it replaced. In terms of value and quality, Todai is worthy of a visit.